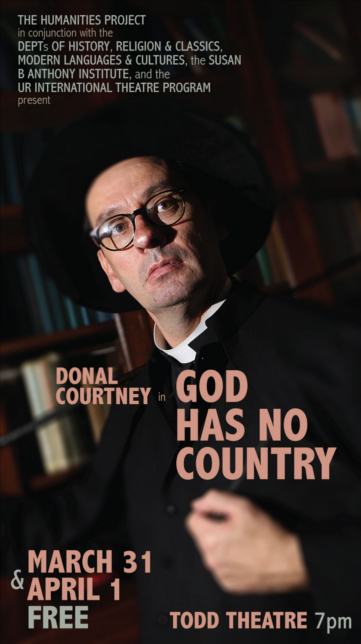 A special theatrical event, imported from Ireland, God Has No Country tells the story of Monsignor Hugh O'Flaherty's courageous exploits in German-occupied Rome during the Second World War." Though little remembered today, this unassuming Irish priest used his connections in the Vatican to harbor prisoners of war and Jews and is credited with saving over 6,500 lives. The play follows O'Flaherty's torment as he decides to act in defense of those suffering under Fascist tyranny. It also reflects on his upbringing in Killarney and on how joining the priesthood protected him from involvement in the Anglo-Irish War. Told with great humor and sensitivity, God Has No Country aims to bring the heroic deeds of this extraordinary but unsung man to a wider audience.